So, this is the second time I've been nominated for the Liebster Award; thank you very much to One More Girl Online for choosing me! This award works by bloggers nominating other bloggers who have less than 200 followers on Bloglovin or they are just new to blogging. It is about recognising new blogs and sharing these to your audience. At the moment I would like to work in the medical profession as I want to help people and I think that I would enjoy this kind of work. 2) What do you like to do in your free time? Well, obviously I enjoy blogging and I feel that photography is linked with this. In terms of other hobbies, I like to play badminton and dance. 3) What is/was your favourite class in school? I absolutely love languages! I think that by learning a language you can appreciate different cultures and it opens up a few doors. 4) What is your ideal weekend? Having a lazy Saturday morning and then perhaps meeting up with friends or spending time with my family. On the Sunday, maybe visiting a city as I love to explore new places! 5) What question(s) do you hate having asked to you? I don't really hate any particular questions being asked but I would have to say I'm the worst decision maker. So if someone, for example, asked what film I wanted to watch, I would dither because I wouldn't want to make the wrong decision or suggest something the other person doesn't want to see. So probably questions like that! 6) What is your favourite holiday and why? I love visiting the south of France and relaxing on the beach in the hot sun! Going back to question 3, I also enjoy practicing my French whilst I'm there. 7) What do you see for yourself in the future? I'm not really sure to be honest, going quite far into the future I'd like to see myself married with children as I have always wanted to have kids! 8) What is something you want to accomplish by the end of this year! Currently, I am working towards an award and I would really like to finish it by the end of this year! 9) When did you start blogging? I started on the last day of 2014 because keeping up a blog was part of my New Years resolutions. 10) What is your idea of a perfect world and what would you change about this one to make it perfect for you? I would say that everyone has equal rights; this is really important to me! I started because I wanted to have a way to document things that I did and have a new way to be creative. I'm awful at art and drawing so having a blog that included photography is a way that I can express my creativity. It is also something fun for me to do in my free time - a hobby! 3) Where in the world would you most like to visit and why? 4) On an everyday basis, what puts a smile upon your face? 6) Who makes you happy? 7) If you could go back in time, what would you tell your younger self? 9) What is your favourite scent? 10) What song are your loving right now? 11) What is your favourite part of blogging? I'd just like to start off by saying that I won't be uploading on Sunday as I am too busy; instead I'm posting today! Previously, I have written many posts that include makeup but not any skincare so I thought I'd show my skincare routine. I try really hard to stick to a regular routine but I do have some nights where I just use a makeup-remover wipe and go straight to bed. When I am keeping up with my routine, these are the products that I use. 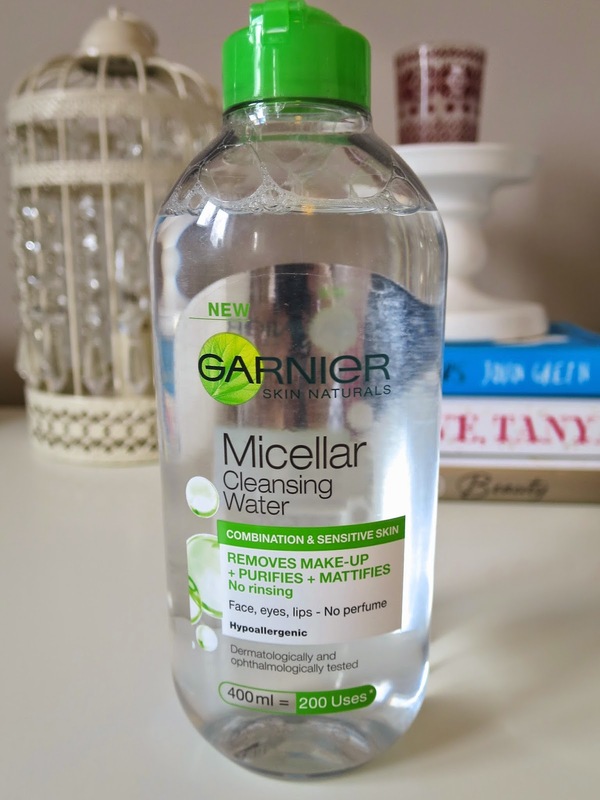 I've mentioned before that I love my Garnier cleansing water! It is really effective at removing makeup without having to use tonnes of product! So to start off my routine, I put some of this on a cotton pad and in circular motions remove my makeup. After, I dampen my skin and apply my Liz Earle cleanse and polish - this product is amazing! It also helps to remove any bits of makeup I have missed. I then take that off with some hot water. Sometimes I add some scrub grains into my cleanser to exfoliate my skin but this is only twice a week. Next, I use my toner from La Roche-Posay, an excellent brand for skincare, and I just sweep this across my face. Finally, I moisturise my skin with another product from that brand. I love this moisturiser as it helps mattify my face as well as hydrate. What products do you use in your skincare routines? Ever since I bought this palette back in February, I have been really enjoying using it. The pigmentation is great which means that this will last for a long time. Before, I had never tried a bronzer and highlighter so I have had to experiment on contouring my face. As the palette is quite small, it's a perfect size to put in a travel makeup bag without having to put every product in separately. I choose to go for the shade 'light' as that is generally my skin type but mainly because I prefer the blush colour in this one than the others. It is a gorgeous shimmery coral (the blush looks slightly brighter in the photos but not by a huge amount). As I have quite oily skin, I tend to steer away for cream consistencies. In fact, I find that the bronzer/blush actually help matify my skin which is a big bonus! So, if you are looking for a new palette like this or have been considering to buy the Face form, I would go for it! It's really worth the price for three powders! What bronzing/highlighting products do you like? If you've read my blog before, you'll know that I include a series of posts themed around, 'Life is like a camera, capture the good times, focus on what's important, develop from the negatives and if things don't work out, take another shot.' So this time I am taking another shot at healthy eating. Recently, my eating habits have been awful! I have gone through the past few weeks eating mainly unhealthy foods. I visited Cornwall last week and when I am away my diet deteriorates. From then onwards, I continued to make poor decisions. Also, I think that because I was quite stressed about everything that has been going on recently, I wasn't really caring about what I was eating. I can now notice a difference in the way I feel and how my skin looks. This has to change for me! From now onwards, I want to make an active effort to eat healthier foods. Easter is coming up so I know that I will be having some chocolate around that time but, if I eat it in moderation, a bit won't do too much harm! I used to make smoothies on Sunday and drink them during the week - I'd like to do this again. In addition, I want to broaden my horizons with the foods that I do eat and try something new. I'm not keen on salad but I'd like to aim to eat more of it. In general, I just want to eat more healthily than I have been doing this month. I think this will make me less tired and help me get through a more stressful period this year. If you have any healthy recipes you enjoy, I'd love to know!! I had been wanting this for a long time before I bought it. A lot of the skincare routine videos/posts I'd read included this product and to me it looked really good. To take my makeup off, I used to use facial wipes and, occasionally, I still use them if I'm in a rush. However, lots of people have said that using cleansing water is better for your skin so I tried this out. My micellar cleansing water is for combination and sensitive skin. I think this is really good because the product then helps to reduce shininess whilst taking my makeup off. In my local boots, I only saw the one for normal/dry skin which wouldn't be right for me. So I'd recommend to hold on and wait for the right product if you're like me - don't just buy the first one you see! I have previously owned an eye makeup remover similar to this and it made my eyes sting. So upon trying this, I was relieved to know that this didn't irritate my eyes. You also don't need a lot of product, a little goes a long way but it depends really on how much makeup you are using. I can normally get away with one cotton pad for my eyes and one for my face with a small amount of the cleansing water on the pads. So if you are looking for a good cleansing water, I would definitely recommend this. It is affordable and works really well - you can get 200 uses out of one bottle! I will be the first to put my hand up and admit that have a Netflix addiction! There are so many great movies and series that I just get too sucked in and I just sometimes spend my whole evening watching it. I suspect that I might not be alone in this; I am definately obsessed. Pretty Little Liars is one of my favourite series. When people started talking about it, I wasn't too sure because I heard that it was hard to get into - I didn't have this problem. Right from the first episode I was hooked. I like that it's not just a teenage girly programme as it has a whole element of mystery around it. Who is A? What happened to Alison etc... I'm only on series 3 so no spoilers guys! But basically this series has become my new favourite, I can't wait to catch up on it. I also really like Gossip Girl. Two years ago I went to New York and I visited the Grand Central Station, at the time I didn't watch the programme but I have been to where Serena Van der Woodson was 'spotted'. I really like the characters in it especially the Humphrey's; I just love their personalities. I have to admit I prefer the old Jenny Humphrey to when she becomes older. Watching Gossip Girl reminds me of when I was in New York, so that brings back good memories and it has a really enjoyable storyline. I feel like I can't do a Netflix Obsessions post without including the first series I watched from start to end. Make it or Break it was mine and my friend's favourite programme for ages. We used to joke around and say we should work at our gymnastic skills. I remember once seeing it, just as a one time thing, on the Tv but I didn't know when the episodes were on so when I saw that it wad on Netflix, I was very excited. This programme is so addicting and I like watching the gymnastic routines in it. There are so many films on Netflix so choosing a film to be my favourite is difficult. However, I have to say that I am really happy that 2 of the Hunger Games films are on there. I read all the books and I enjoy the films. Another good film on there is Abduction, I mainly watch this over and over because I love Taylor Launter - guilty - but the storyline is intriguing too. What are your favourite series/films on Netflix? Are you addicted like me? Am I too old to watch Disney for the first time? I'd just like to point out that I had a great childhood and I am truly thankful for that. I don't want this post to sound like I missed out because I really didn't. Many children grow up memorised by the world of Disney but I was more into my Barbie films - my favourite being the Nutcraker! Even now my friends make references to the films and I can't really join to these conversations. Yes, I did watch some Disney films but just really the classics, such as 'Cinderella' and 'Beauty and the Beast'. I feel that there is a whole range of films that I haven't watched and I would like to try to see some of these. My family and I have visited Disneyland Paris on many occasions which I really enjoyed; the whole experience is amazing. When I came home from these trips, I used to say to myself that I should watch some more Disney films but I never really did. Maybe I am feeling a bit sentimental and want to watch something that would remind me of being little. I know that Disney is for all ages and so many people still enjoy watching it. In a way, I want to jump onto the bandwagon of being Disney crazy but in order to do that, I feel like I should give myself an in-depth Disney education. There are so many movies that are either coming out or are already made, which are inspired by the Disney originals. I know that Cinderella is out soon and brands like MAC are releasing products for the film. So basically what I am going to try to do is watch some old Disney films and really get into the craze surrounding Disney. If you have any films that you think I should definitely watch, feel free to drop me a comment and I will most likely take your recommendation up! I am normally running late in the morning so I like to stick with an easy and relatively quick makeup routine. Before I put on my makeup, I moisturise my face as I find that it helps keep my makeup on for longer. Then I apply my BB cream because it leaves my skin looking more natural than if I applied a foundation. However, at the weekend I do wear foundation as I have a bit more time to blend it in properly. For concealer, I wear two: Wake Me Up by Rimmel and the Collection Lasting Perfection concealer. I put my Collection one on any blemishes or redness and the other concealer under my eyes. After that, I powder my face with my Stay Matte from Rimmel. This powder has a lot of hype and I can see why as it keeps me looking matte for hours. I've recently purchased a blush/highlight/bronzer palette from Sleek and I'm really loving it. The bronzer is matte so it's good for contouring and then I apply the highlight across my cheek bone and sometimes along my brow bone too! 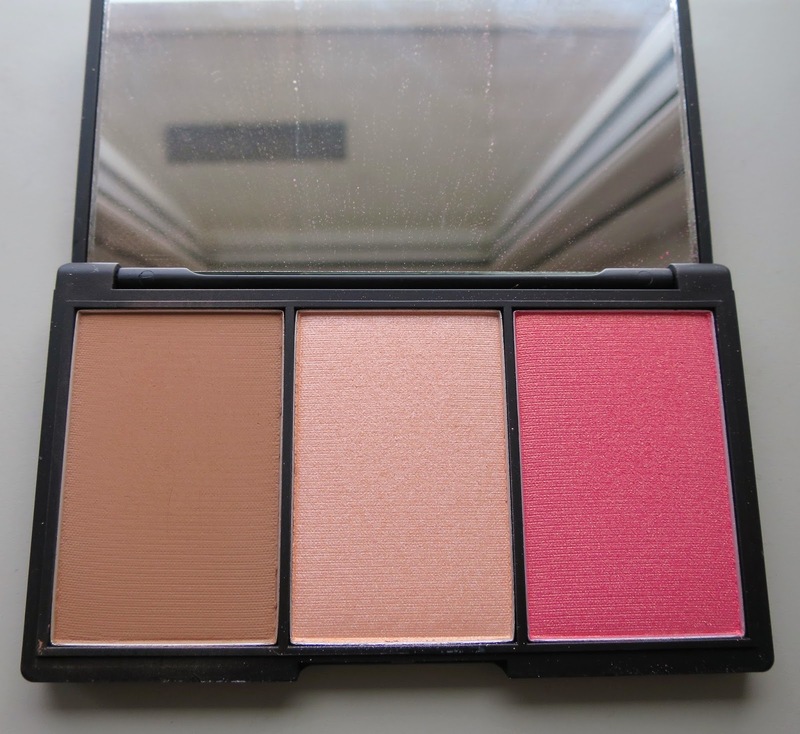 This blush is really pretty, the perfect shade for this time of year, I apply this on the apple's of my cheek. For my eyes, I only really apply mascara and mine is the They're Real from Benefit. This is really good because it holds all day without smudging. Finally, I put on some lip balm to moisturise my lips; this one is from Model's Own. What products feature in your daily makeup routine? Ps. I'd just like to explain my posts for next week. They will be going up on the Saturday and Sunday instead of Wednesday and Sunday because I'm unable to upload on Wednesday. I thought that I would do a list of 20 books that I would recommend to read. All of these I have read myself and I have enjoyed. This is all based on my taste so you may think that some aren't your cuppa tea but that's fine. I was a bit stuck on what I should write for today's post so when I was packing my bag to go out over the weekend, I decided to take some photos of what I was putting in it. The bag I used on that day is from Topshop and I absolutely love it! I bought it last year so I'm not sure if you can buy it now but there are similar bags sold elsewhere. It is in a lovely mint green colour with gold panels down the front. Mint green is one of my favourite colours and I feel like it brightens up my outfit as I'm normally wearing black/grey. The bag holds quite a lot and has a phone pocket within. So what do I put in it? Well, I'm not the person who brings everything but the kitchen sink in their bag as it gets too heavy for me. I like to only pack the essentials - you may question whether makeup is an essential? No it's not but on that day I decided to put my favourite lipstick and a powder in to touch up my makeup during the day. I featured this Urban Decay lipstick in my February favourites, it is the perfect everyday colour for me! For the Rimmel Stay Matte Powder, I have oily skin so it's nice to have a powder to reduce shininess throughout the day! 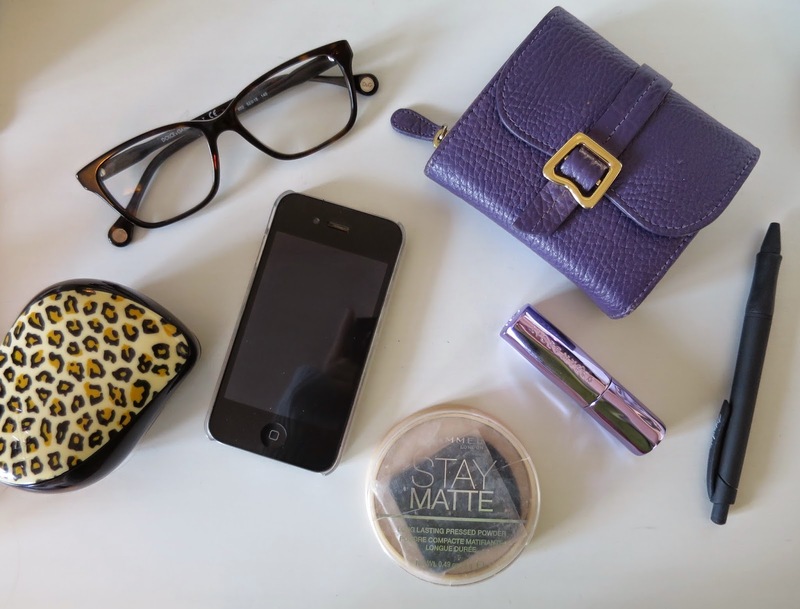 My beloved Tangle Teezer comes everywhere with me; I have a compact one so it fits in my bag nicely. I find that my hair gets really knotty especially when it's windy outside so I can just whip this out and detangle my messy hair. Also, I take my purse with me, I've actually had this one for a while. I bought it in Bistow Village in the Radley shop, I remember that I got it for £25 which is a good discount. It just holds my money and cards etc. I like to bring a pen with me in case I need it. This one is from Paperchase and I think I bought it in a set of three. In addition to that, I keep my glasses in my bag. I've only recently started wearing these when I'm concentrating or reading as I was previously getting headaches when doing those things. Since having them, my headaches have stopped and I'm getting on well with them. Finally, my phone - mine is a iPhone 4 and I mostly use it for music on the go but obviously calls and texts as well. So that is everything that I keep in my bag! What is your staple item that you carry around with you? Tangle Teezer - This has always been my staple home detangling hairbrush, however, this month I have been popping it in my bag before I go out. Before, I used to take a compact one which pushes up - I'm sure you will know what I mean - and it's okay but I feel that my Tangle Teezer does a better job at detangling my hair. Boujois Healthy Mix Serum - I have been wearing this a lot recently because it is very lightweight so it gives a natural base. As I have oily skin, some foundations make me look really shiny but this one, with powder, doesn't gives me any shiny areas. A definite recommend for oily skin! Watch - Maybe an odd thing to include but I have worn my watch everyday this month. Previously, I have forgotten to put it on as I am in a rush, however, this month I have made an active effort to remember - it becomes part of a routine. I really love the design and I find myself looking at it during the day most likely because it's rose gold. Urban Decay Lipstick (Sheer Obsessed) - This is such a pretty pink and it is my everyday lip colour. I like the fact that it is sheer because I find that easier to apply. The packaging is beautiful, it is almost a mirrored purple. If you would like a sheer lipstick, the ones from Urban Decay are long-lasting and they have a lovely range of shades. Rimmel Exaggerate Eyeliner - I'm so glad that I picked this up in waterproof as all my other eyeliners smudge in the rain and this one stays in place. This is a great product for me as I feel like it is in-between a liquid and a felt-tip eyeliner. The applicator is like a felt-tip so it is easy to apply and it has plenty of product as you dip it in the liquid beforehand. Most days this month I have worn this across my eyes and flicked out. Barry M Nail Polish (Pit Stop) - I am so happy that I found this. The colour is a purply grey and it looks really pretty on the nails. As the range states, it is very quick drying and is a strong enough colour that you only really need one coat. I have been wearing this on my nails this past week and it has barely chipped! I have really enjoyed Pretty Little Liars again this month, I know I mentioned it in my January favourites but I am still obsessed. I'm only on series 2 so I have a bit of catching up to do! Also, I have watched Dance Moms a lot recently; I just find it interesting and I love to see all the different dances. I wish I could be that good!! What were you favourites this month?